Finiteness Conditions and Index in Semigroups and Monoids. EPSRC PDRF, EP/E043194/1 ï½£203,056. An EPSRC post-doctoral fellowship, won by Dr Robert Gray, which will bring him back to CIRCA from February 2008. CP Summer School – Modelling with Constraints: Theory and Practice, 29th June-4th July, 2008. 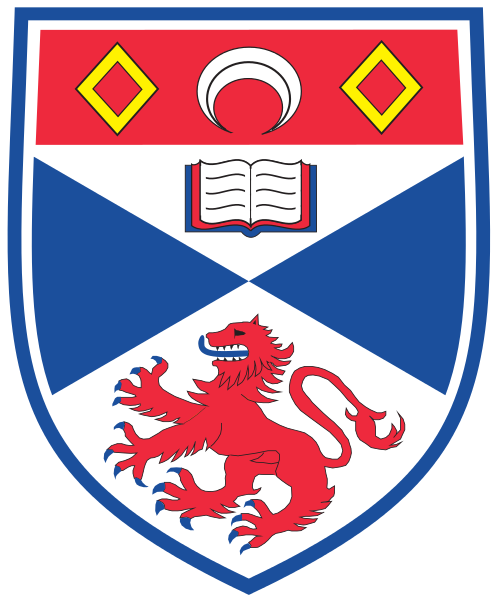 University of St Andrews. A. Al Zain, J. Berthold, K. Hammond and P.W. Trinder Orchestrating Production Computer Algebra Components into Portable Parallel Programs To appear in Proc. Open Source Grid and Cluster Conference, May 2008. A. Al Zain, J. Berthold, P.W. Trinder, K. Hammond and R. Loogen Parallel Functional Middleware for Computational Algebra Systems. Intl. Symp. on Trends in Functional Programming (TFP 2008), The Netherlands, May 2008. Victor Bovdi and Alexander Konovalov Integral Group Ring of the Mathieu Simple Group M23Communications in Algebra, Volume 36, Issue 7, July 2008, pages 2670 – 2680. Victor Bovdi, Alexander Konovalov and Eduardo do N. Marcos Integral group ring of the Suzuki sporadic simple group Publ. Math. Debrecen 72/3-4 (2008), 487-503. R. Brignall, S. Huczynska and V. Vatter Simple permutations and algebraic generating functions Journal of Combinatorial Theory, Series A, 115 (2008), no.3, 423–441. R. Brignall, S. Huczynska and V. Vatter Decomposing simple permutations, with enumerative consequencesCombinatorica 28 (2008), no. 4, 385–400. R. Brignall, N. Ruskuc and V. Vatter Simple permutations: decidability and unavoidable structures Theoret. Comput. Sci. 391 (2008), 150-163. A.J. Cain, G. Oliver, N. Ruskuc and R.M. Thomas Automatic presentations for cancellative semigroups in Language and Automata Theory and Applications, Lecture Notes in Computer Science 5196, Springer, Berlin, 2008. A.J. Cain, N. Ruskuc and E.F. Robertson Cancellative and Malcev presentations for finite Rees index subsemigroups and extensions J. Australian Math. Soc. 84 (2008), 39-61. Alan J. Cain, Edmund F. Robertson and Nik Ruskuc Cancellative and Malcev presentations for finite Rees index subsemigroups and extensions J. Aust. Math. Soc. 84 (2008), 39-61. Alexandru CÃ¢rstea, Georgiana Macariu, Dana Petcu and Alexander Konovalov Pattern Based Composition of Web Services for Symbolic Computations Lecture Notes in Computer Science, Volume 5101/2008 (Computational Science â€“ ICCS 2008, 8th International Conference, KrakÃ³w, Poland, June 23-25, 2008, Proceedings, Part I), pages 126-135. A.Carstea, M.Frincu, A.Konovalov, G.Macariu, D.Petcu On Service-oriented Symbolic Computing Parallel Processing and Applied Mathematics, Proceedings of PPAM 2007 (http://www.ppam.pl/) LNCS 4967, Springer, 2008, p.843-851. U.B. Darji and J.D. Mitchell Highly transitive subgroups of the symmetric group on the natural numbers Colloq. Math. 112 (2008) 163-173. L. Descalco, N. Ruskuc Properties of the subsemigroups of the bicyclic monoid Czech. Math. J. 58(133) (2008), 311-330. M. Droste, R. Gray and J.K. Truss Construction of Some Uncountable 2-arc-transitive Bipartite Graphs, Order 25 (2008) 349-357. J. Farrell, R. S. Perry, A. Rost, J. F. Mercure, N. Kikugawa, S. A. Grigera & A. P. Mackenzie Effect of electron doping the metamagnet LaySr3 yRu2O7 Phys. Rev. B 78, 180409(R) (2008). A.M. Frisch, I. Miguel (eds). Special Issue on Abstraction and Automation in Constraint Modelling. Constraints 13 (3), 2008. A.M. Frisch, W. Harvey, C. Jefferson, B. Martinez-Hernandez, I. Miguel ,I.Essence: A Constraint Language for Specifying Combinatorial Problems, Constraints 13(3), 2008. Ian P. Gent and Ian Miguel and Peter Nightingale Generalised Arc Consistency for the AllDifferent Constraint: An Empirical Survey Artificial Intelligence, Volume 172 number 18 pages 1973-2000. Ian P. Gent, Peter Nightingale, Andrew Rowley and Kostas Stergiou Solving Quantified Constraint Satisfaction Problems Artificial Intelligence, Volume 172 (2008) pages 738-771. I.P. Gent, I. Miguel, A. Rendl. Common Subexpression Elimination in Automated Constraint ModellingProceedings of the International Workshop on Modeling and Solving Problems with Constraints, 2008. R. Gray and J.D. Mitchell Largest Subsemigroups of the Full Transformation Semigroup, Discrete Math. 308 (2008), 4801-4810. R. Gray and N. Ruskuc Green Index and Finiteness Conditions for Semigroups J. Algebra 320 (2008), 3145-3164. R. Gray and J.K. Truss Construction of Some Countable One-arc Transitive Bipartite Graphs Discrete Math. 308 (2008), 6392-6405. A. Grayland , I. Miguel and C. M. Roney-Dougal. Confluence of reduction rules for lexicographic ordering constraints Eighth International Workshop on Symmetry and Constraint Satisfaction Problems, 2008. George Havas, Edmund F. Robertson and Dale C. Sutherland Behind and beyond a theorem on groups related to trivalent graphs J. Aust. Math. Soc. 85 (2008), 323-332. P. E. Holmes, S. A. Linton, E. A. O’Brien, A. J. E. Ryba and R. A. Wilson Constructive membership in black-box groups Journal of Group Theory (2008) 1-17, de Gruyter ed. S. Huczynska and N. Ruskuc Pattern classes of permutations via bijections between linearly ordered setsEuropean Journal of Combinatorics 29 (2008), no. 1, 118–139. V. Janjic and K. Hammond Prescient Scheduling of Parallel Functional Programs on the Grid Intl. Symp. on Trends in Functional Programming (TFP 2008), The Netherlands, May 2008. V. Janjic, K. Hammond and Y. Yang Using Application Information to Drive Adaptive Grid Middleware Scheduling Decisions Intl. Workshop. on Middleware-Application Interaction (MAI 2008), Norway, June 2008. U. Leonhardt and T. Tyc, Superantenna made of transformation media New J. Phys. 10, 115026 (2008). U. Leonhardt and D. R. Smith Focus on Cloaking and Transformation Optics Editorial, New J. Phys. 10, 115019 (2008). M Livie, S Brett, T W Kelsey, K Whalley, R Hume, A Burchell, M Rajkhowa A report on a two year experience in the recruitment of embryo donors for human stem cell derivation Human Reproduction; Oxford University Press, Oxford, UK; 23(1):166-167, 2008. H.-W. Loidl, P.W. Trinder, Hammond, A. Al Zain and C. Baker-Finch Semi-Explicit Parallel Programming in a Purely Functional Style: GpH Chapter in Process Algebra for Parallel and Distributed Processing, Alexander M, Gardner W (Eds), Chapman Hall (2008). Max Neunhoeffer and Sarah Scherotzke Formulas for primitive Idempotents in Frobenius Algebras and an Application to Decomposition Maps Representation Theory 12 (2008), p. 170-185. Max Neunhoeffer and Cheryl E. Praeger Computing Minimal Polynomials of Matrices LMS Journal of Computation and Mathematics. 11 (2008), p. 252-279; 2008. T. Ochiai, U. Leonhardt, and J. C. Nacher A novel design of dielectric perfect invisibility devices J. Math. Phys. 49, 032903 (2008). T. G. Philbin and U. Leonhardt Alternative calculation of the Casimir forces between birefringent plates Phys. Rev. A 78, 042107 (2008). G. Rousseaux, C. Mathis, P. Maissa, T. G. Philbin, and U. Leonhardt Observation of negative-frequency waves in a water tank: a classical analogue to the Hawking effect? New J. Phys. 10, 053015 (2008). N. Ru, R. A. Borzi, A. Rost, A. P. Mackenzie, J. Laverock, S. B. Dugdale, & I. R. Fisher De Haas van Alphen oscillations in the charge-density wave compound lanthanum tritelluride (LaTe3) Phys. Rev. B 78 045123 (2008). A. Tamai, M.P. Allan, J.F. Mercure, W. Meevasana, R. Dunkel, D.H. Lu, R.S. Perry, A.P. Mackenzie, D.J. Singh, Z.-X. Shen, and F. Baumberger Fermi surface and van Hove singularities in the itinerant metamagnet Sr3Ru2O7Phys. Rev. Lett. 101, 026407 (2008). T. Tyc and U. Leonhardt Transmutation of Singularities in Optical Instruments New J. Phys. 10, 115038 (2008). B. Vignolle, A. Carrington, R. A. Cooper, M. M. J. French, A. P. Mackenzie, C. Jaudet, D. Vignolles, Cyril Proust & N. E. Hussey Quantum oscillations in an overdoped high temperature superconductor Nature 455, 952 (2008).